In addition to more fantastic stories featuring such characters as Nick Fury and The Punisher , comic-book writer Garth Ennis has a long personal history of telling gritty, realistic, and fact-filled tales of war. There are, for example, two four-issue mini-series with the title "War Stories," published by Vertigo in 2001 and 2003 . And there are more than eight collected volumes of his "Battlefields" series, published by Dynamite Entertainment starting in 2008—each comprising quirky, fact-filled stories about lesser-known aspects of history, driven by memorable characters. In three of those "Battlefields" volumes, for example, appeared stories of British tank crews, each headed by a veteran sergeant whose Tyneside dialect was thicker than the armor that protected them. Seriously, Sgt. Stiles's dialogue is harder to interpret than reading Shakespeare. But much more fun. "The Tankies" (Battlefields, Vol. 1) : Cpl. Stiles and his crew man a British Churchill tank during the battle for Normandy. "The Firefly and His Majesty" (Battlefields, Vol. 5) : Sgt. Stiles and a new crew man a new Sherman Firefly—no longer always outgunned, but still not a match for the German King Tiger that lies in wait for the Allied advance. "The Green Fields Beyond" (Battlefields, Vol. 10) : World War II veteran Stiles continues fights on in the Korean War, as part of a Centurion tank crew assigned to the 8th King's Royal Irish Hussars. 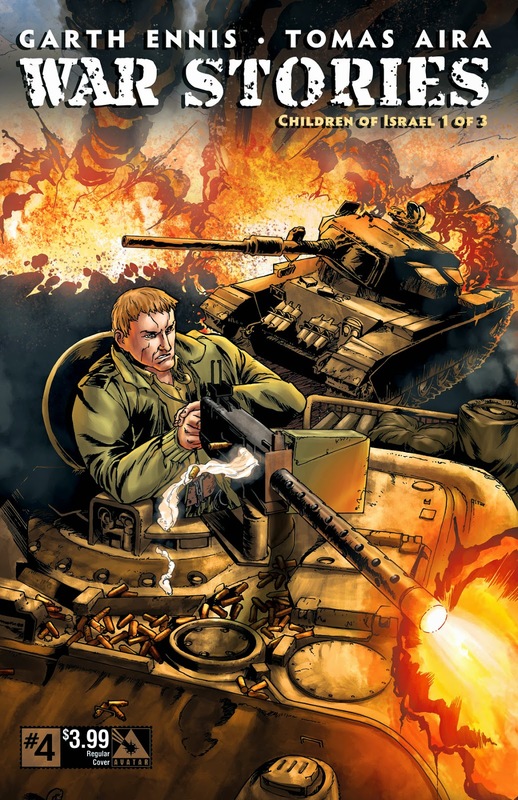 The armored pedigree is important, insofar that it demonstrates not only that Ennis knows his way around a story, but that he knows his way around a tank as well. This is fiction, but fiction with a point—and the point is to illuminate history. Ennis aims toward realism, not sensationalism. These are not books for children. 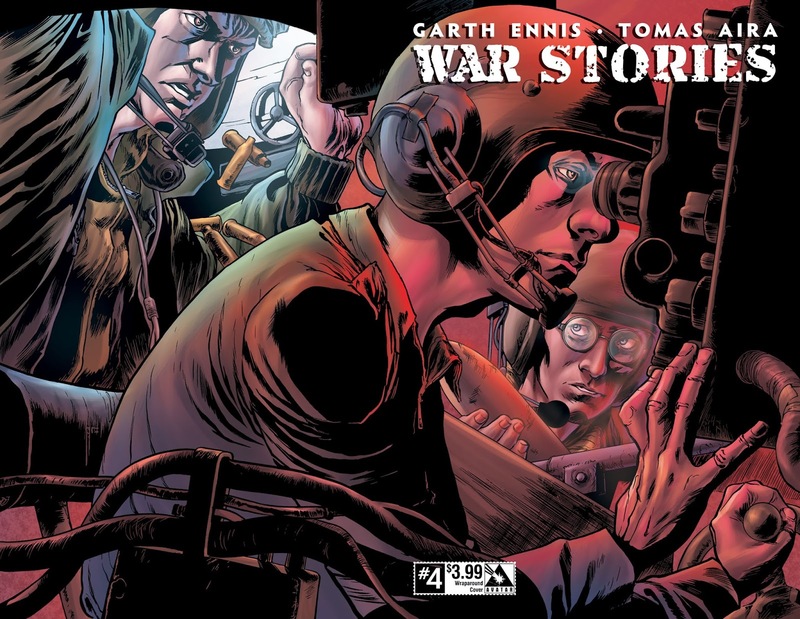 Now arrives from Ennis a newly launched "War Stories" series, this time published by Avatar Press. In issue No. 4, on stands Jan. 7, starts "Children of Israel," a 3-part story of an Israeli tank crew on the Golan Heights in early October, 1973. The artist is Tomas Aira, who delivers serviceably expressive characters, along with technically appropriate military equipment. Nothing kills a war comic like in inaccurately rendered weapons. The tank is again a Centurion, but its commander is a yet-unnamed sergeant who was a boy during World War II. The character remembers seeing the inside of a German tank—most likely a Panzer III—while living the Warsaw Ghetto, as well as being liberated by Soviet T-34s in Auschwitz-Birkenau. The first issue is heavy with exposition, but Ennis makes it all clank together nicely. The sergeant talks with his captain about the current strategic and political terrain. The latter has helpfully drawn a map in the sand for some visiting journalists. "You shouldn't talk to reporters, Captain," the sergeant advises. "It only encourages them." Chaim's the driver, a little bullet of a man from Nazareth. Not much seems to shake him [...] Gunner Daniel is a lethal shot, but lacks imagination. Independent action is beyond him. He'll never be promoted, never wonder why. The loader, Shlomo, is a nervous wreck. Given the approachable ways that Ennis communicates military history, one hopes that he continues his armored march toward present day. The "War Stories" series is currently only available in monthly issues. Check your local comic store, or on-line retailers. or digitally via Comixology. Note that there are multiple variant covers.